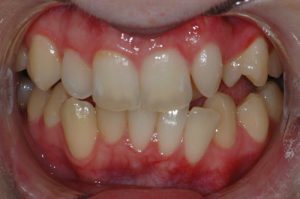 Goodison Dental | Smile Gallery – Teeth For LifeGoodison Dental Wangaratta Dentist - Teeth For Life! 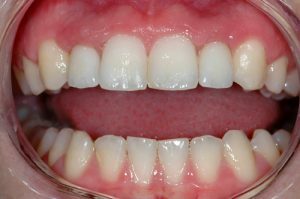 Everyone wants a Great Smile, and at Goodison Dental, we make it our ambition to provide you with the best solution to suit your personal dental needs, and of course, to ensure you keep your Teeth For Life! 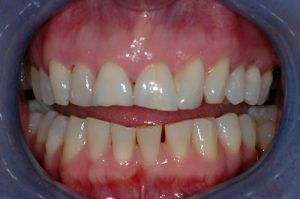 Below are a few examples of the treatments options we can provide to help you wear your Best Smile. 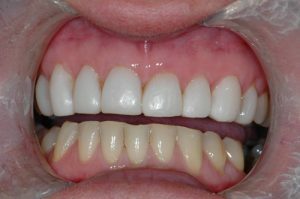 Composite Veneers are completed right here in our surgery, in the one appointment and create an instant transformation to your smile. 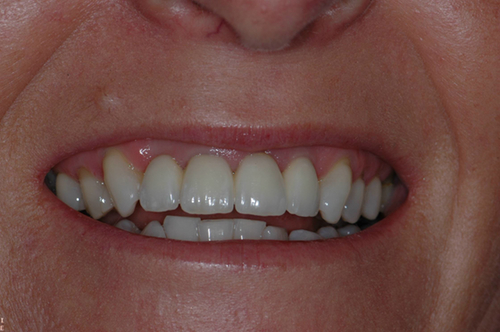 Choosing Porcelain for your Crowns and Veneers offers a long term, more aesthetic result for your smile. This treatment is completed over 2 visits. 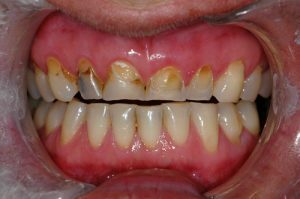 Dental Implants in Wangaratta – Teeth For Life! 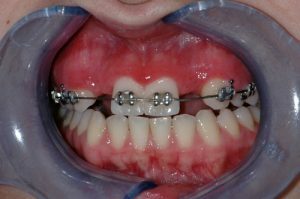 Dr Tony Goodison is a fully qualified Implantologist with over 15 years experience in placing implants. 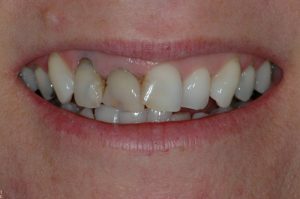 A dental implant is essentially a new titanium ‘root’ with a porcelain crown placed on top, and is the strongest, long term solution to replacing either a single tooth, or multiple teeth using an Implant supported bridge or denture. The Implant surgery and placement is completed over 2-3 visits. For this patient, both damaged teeth were extracted and an implant was placed in the upper central site. 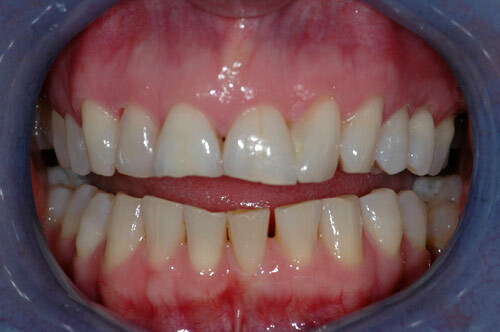 A porcelain crown with the 2nd tooth attached to it was fitted to form the ‘bridge’. There were smiles all round on completion. Taking impressions of your teeth, we create your personally fitted whitening trays which are then used with Pola Night whitening solution – all in the comfort of your own home. 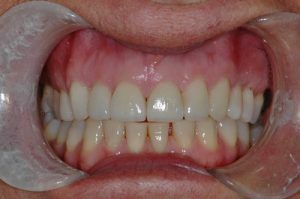 Over many years of trialling other products, we have found Polanight to achieve the longest lasting affects for a white, bright smile. The Pola Night gel contains a desensitising agent which acts on the nerve endings, and desensitises them at the pulp-dentin border, in turn minimising sensitivity and maximising patient comfort. 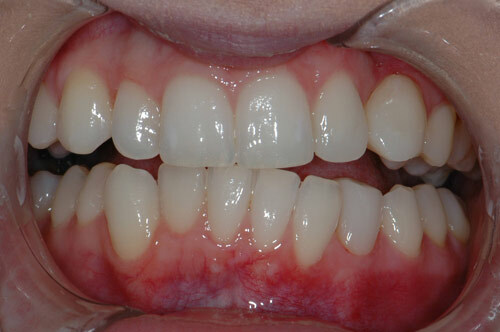 The initial whitening phase usually takes around 10 nights. In this case, the patient used our ‘at home’ Pola Night teeth whitening process, then we shade matched 2 veneers to even the smile.